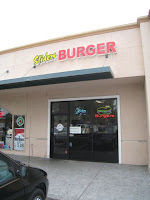 Sliders Burger in San Jose, CA hides in a strip mall. I drove right by the first time. But was glad I turned around and headed back. 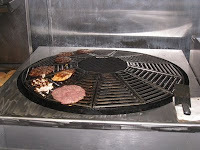 Started about 4 years ago, the place takes its burgers seriously, grinding their own chuck in the store and grilling them up on a very cool rotary grill over coals. Given a choice between a six-ounce and an eight-ounce burger, I chose the half-pound. The Bacon Cheeseburger combo with fries and a drink costs $7.50. Add onion rings into the mix for an extra buck. Sliders features a clean dining room with wood tables and a tiled floor. CNN blared from a flat screen mounted on the wall in the back of the restaurant. Everyone in the crowded place watched the updates on swine flu. Stainless steel and black-and-white tiles on the walls give the place a slight retro feel. 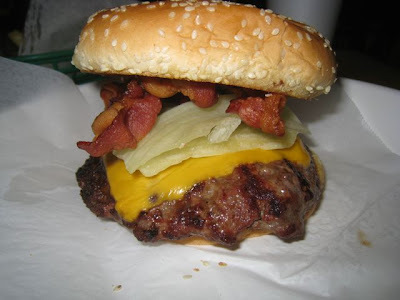 The burger comes with only the patty, American cheese and bacon sitting on a nicely toasted sesame bun. Someone else got the grilled onions and mushrooms. I will try that next time. The well-equipped condiment bar features lettuce, tomato, onion, and several sauces. I added some lettuce and thousand-island dressing to my burger. The burger sported a juicy and flavorful patty, very nice with a charcoal-tinged flavor. The bun sprang fresh and tasty, the bacon crunching along. The thickly cut fries radiated their heat but disappointed when compared to the burger. 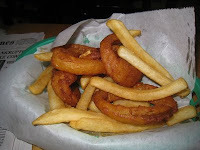 Though hot and crunchy, the unremarkable onion rings sat blandly on the tongue. Putting as much energy into the side dishes as the burger would make Sliders a standout burger joint in San Jose. But the burger alone makes the trip worthwhile. 1645 W. San Carlos St.